The River’s mission is to bring life to dead places by EMPOWERING everyday people to LIVE and LEAD like Jesus. We think this will happen as we pursue these three priorities: Passionate Spirituality; Radical Community; Missional Zeal. In order to empower every single person to grow in their missional zeal, we are offering this simple tool to help any person communicate the Gospel with confidence when the opportunity presents itself. THE GOSPEL (or Good News) is that God himself has come to rescue and renew all creation through the work of Jesus Christ on our behalf. 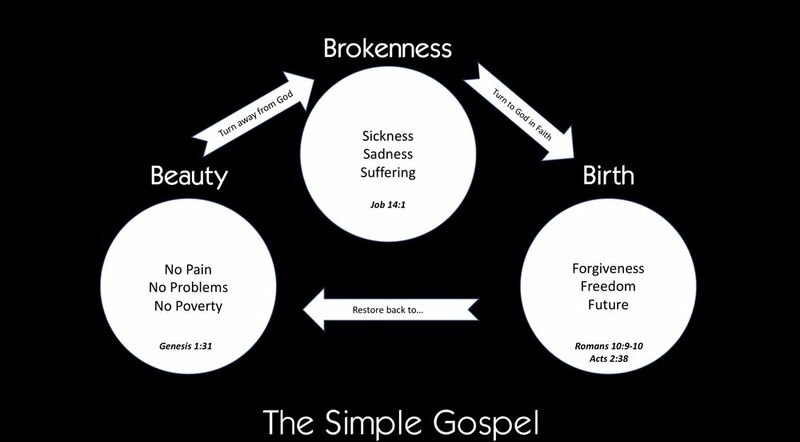 We call this tool The Simple Gospel, or The Three Circles. Essentially, there are three images that represent three words. This forms the backbone of the meta-narrative of Scripture. The first image is of a beautiful and inviting GARDEN. The word associated with this image is: BEAUTY. The second image is of a cemetery. The word associated with this image is: BROKENNESS. The third image is of a newborn baby. The word associated with this image is: BIRTH. There was a time in history when there was nothing but God and creation. It was perfect. It was peaceful. It was beautiful, just like a GARDEN. It was in a real place somewhere in the Middle East and there were two people in that GARDEN. There was perfect harmony between them and with God. There was NO PAIN. There were NO PROBLEMS. There was no POVERTY. It was truly paradise. Every single person you will ever encounter has a longing and deep desire to experience this kind of BEAUTY in their lives. It was a place where each person understood their identity and their purpose. It was a place of wholeness. Because every person alive has freedom from God to choose, the two in the GARDEN decided to TURN AWAY FROM GOD. It led them to BROKENNESS. In fact, all brokenness is the result of turning away from God’s BEAUTY. The Bible calls this sin. It’s a choice that every person you will ever meet has made. Beauty turns to Brokenness. Brokenness in this life is often experienced as SICKNESS, SADNESS, or SUFFERING. There’s not a person on the planet that you have ever met that doesn’t understand sickness, sadness, and suffering. Every person has a dream in their heart for BEAUTY. That dream is present because God has planted it there. But their reality is BROKENNESS. It’s the human experience because of our decision to turn away from God. This brokenness often leads to a lack of identity and purpose. We don’t know who we are and what our purpose in this world is. The verse that highlights this circle is Job 14:1 (NLT). It says, “How frail is humanity! How short is life, how full of trouble!” This captures a lot of life. Lots of dysfunction and lots of tears. You and I experience it everyday and people all around us experience it everyday as well. Beauty is the way it was supposed to be. Brokenness is the way it is. Jesus is born into this world, into its pain, and into its brokenness. He died on the cross to pay for all the brokenness and sin. And then he was resurrected from the dead (rose from the cemetery) signifying that he has victory over all the death and all the brokenness. All who believe in him will be restored and renewed. The promise that is offered by Jesus in this new BIRTH is for FORGIVENESS, FREEDOM, and a new FUTURE. God restores us back to BEAUTY, back to the way God intended it to be. That is The Simple Gospel or The Three Circles. To grow in your GOSPEL FLUENCY you need three things: 1) You need to be able to tell The Simple Gospel. 2) You need to understand how your story connects to the meta-narrative of Scripture. 3) You need to be able to connect the person who are helping lead to Jesus their story to the meta-narrative of Scripture. This is where vulnerability is so important. Your story will often connect with their story through being vulnerable about your times of brokenness. This is why it’s important to take the time to think through your life and to work through the various BROKENNESS in your story so that you are prepared to talk about it with VULNERABILITY.